WEIGHT (empty) = 316 lbs. Holds a total of 25 In-Line trade show booth hardware (pipes and bases). Solid steel frame for maximum durability. Black finish. Bolted-on casters for easy future replacement, if ever needed. Price includes 2 swivel casters and 2 rigid casters. Please note that there is no dedicated storage area for drapes. This item is made to order and has an extended production time. Lead time varies and is typically 2-3 weeks before shipping. Shipment by freight truck is required. This item is not eligible for Free Shipping. This item typically ships within 10-15 business days (2-3 weeks)*. 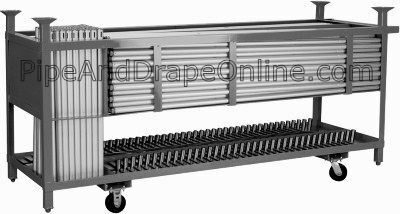 Large orders may have an additional production lead time before shipping. 1) If you have a forklift, raise the cart off the ground. If you do not have a forklift, simply lay the cart on its side on the ground (we suggest laying the cart on cardboard to prevent scratching the finish). 2) Install the two swivel castors at the back of the cart with the hardware provided by placing the bolts in the pre-slotted holes and tightening with a 5/8 wrench. 3) Install the two ridged castors at the front of the cart with the hardware provided by bolting in the pre-slotted holes and tightening with a 5/8 wrench. 4) Stand the cart upright and you are ready to use! All of our carts ship with one set of ridged and one set of swivel castors. 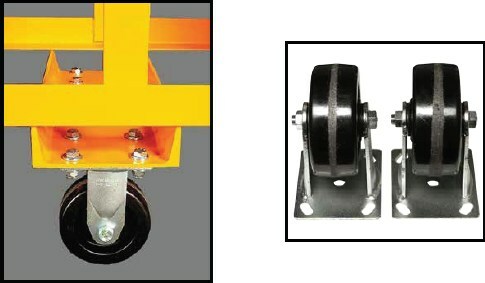 Make sure you place both swivel castors at one end of the cart and both ridged casters at the opposite end of the cart for optimal handling.